This Sign Supply is Only One of Hundreds of Models that Our Large Online Warehouse Has in Stock! 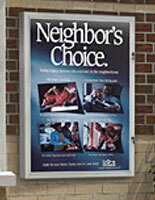 This Tough Sign Supply Designed For Outdoor Usage Has a Swing Open Door to Protect Images and Posters! 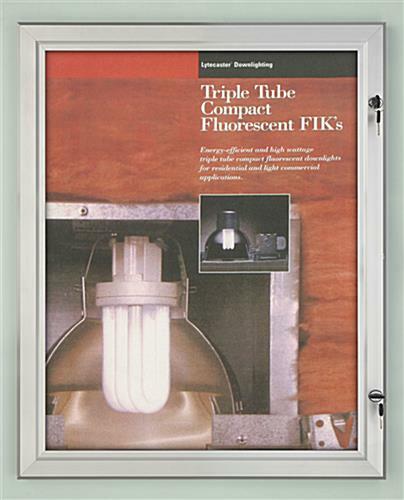 Rubber gaskets prevent moisture from entering the poster bulletin board. 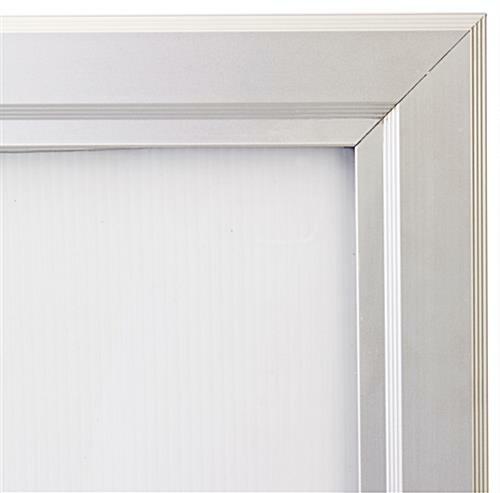 Anodized aluminum sign frames are both durable and stylish. 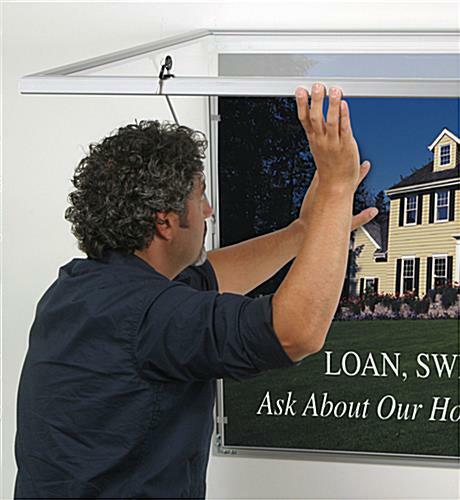 The swing open poster board locks to prevent tampering. 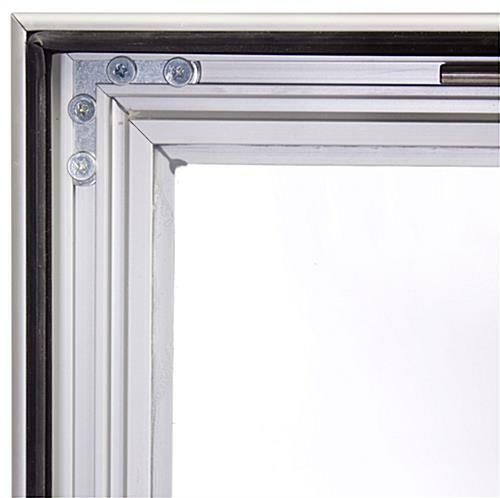 Hardware included for mounting in vertical or horizontal orientation. These visual graphic frames don't just keep images protected outside. This metal sign supply that accommodates 22" x 28" images locks to keep posters safe as well. Two sets of keys are shipped with each sign supply. The fact that every aluminum sign supply locks closed means advertisers can sleep easy knowing that their sign will not be vandalized. The outside exhibit poster holders incorporate a silver anodized aluminum composition. The aluminum production is more long-lasting and weather resistant than wood, as well as being more fashionable than acrylic. The sign supply which is silver has a fashionable contemporary appearance that enhances the surrounding setting. The matte silver finish permits these sign frames to match with most contemporary locations. These models tend to be great for exhibiting a wide array of signs, as well as commercial media content, menus, and directories. A tool kit is provided with the order of these bulletin boards and comes with four (4) anchors and four (4) screws. 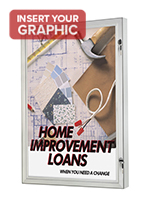 These showcases can be hung in landscape or portrait format, which renders them more flexible than similar merchandise provided by competitors. This encased sign supply protects notices from water and destruction in outside locations. The characteristics that make these poster frames weather resistant are rubber gaskets and a hard acrylic protective lens. The strong rubber gaskets snuggly fit around this exterior sign supply, sealing out any moisture. There is a rigid acrylic lens affixed in the visual graphic frames to supply a non-glare layer of protection from dust, fingerprints, and water. This durable sign supply that has rubber gaskets is extraordinarily great for keeping signs dry. The hinged door design has other advantages as well. The aluminum sign supply opens easily, meaning updating the display is a one-person duty. On the interior of the panel, there are two arms that hold the door open to let changing signage be fast and simple. 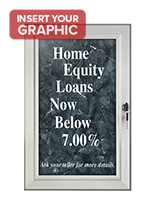 Buyers do not have to dismount the aluminum sign supply to be able to insert new images. Signage affixes to the white corrugated acrylic backer with four snaps. 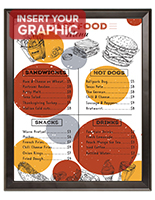 The sign supply showcases posters and other images that measure 22" x 28", offering a observable area of 21-1/8" x 27-1/8". Graphic Size: 22" x 28"
Viewable Area: 21-1/8" x 27-1/8"
24.8" x 30.9" x 1.3"